Owsley then provides a chronological list of trumpeters from the St. Louis area – beginning with Charles Creath and Dewey Jackson, then adding Miles Davis, Clark Terry, Floyd LeFlore and Lester Bowie as prime examples of his thesis. Davis, who died in 1991 at the age of 65, has achieved a level of celebrity far beyond the other trumpeters Owsley lists – and far beyond just the world of jazz. Drop the word “Miles” in any conversation related to music in any country around the world and it’s understood you’re talking about Miles Dewey Davis III, who was born in Alton, grew up in East St. Louis and became a constant force for change and innovation in music for decades. But when you look at a copy of “City of Gabriels,” the close-up photo on the cover is of a trumpet that belonged to Clark Terry. 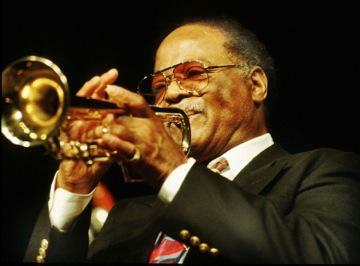 Clark Terry still played his horn upside down in the late 1980s. That choice seems exactly right, given Terry’s distinguished musical career -- and his immense influence on jazz here in St. Louis and around the world. Born in 1920, young Clark was attracted to horn players at an early age. His sister was married to the tuba player in Dewey Jackson’s band, and young Clark used to attend rehearsals. He even making his first horn from spare parts he found in junkyards, as I learned when I first had the opportunity to interview Terry 20 years ago. Terry eventually got his first real horn – a valve trombone – when he attended Vashon High School. He eventually got to play trumpet, and by the time he enlisted during World War II, he had played with bands on the carnival circuit in the south and toured with blues singer Ida Cox. During the War, Terry played with the talented band at the Great Lakes naval Station in Chicago, where he met Lionel Hampton. Terry briefly joined Hampton’s band after the war, returned to St. Louis to play with bandleader George Hudson, then joined the Count Basie band in 1948. He joined the Duke Ellington Orchestra in 1951, remaining there for almost a decade. In the Fifties Terry also began releasing recordings as a leader, and in 1960, he became the first African-American musician to be hired for the NBC Staff orchestra – where he became a fixture on the “Tonight Show” with his famous “Mumbles” routine – singing incoherent lyrics to a blues tune that had his fellow musicians, Johnny Carson and the audience laughing hysterically. As Terry told me in our 1993 interview, “Mumbles” actually evolved from his early experiences hearing music in St. Louis clubs. 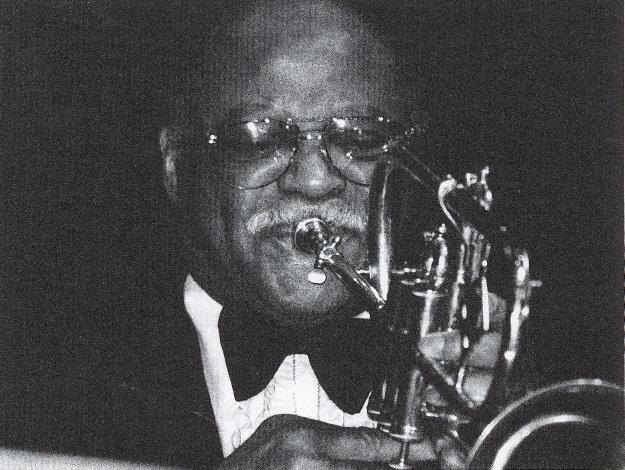 Clark Terry was an enthusiastic teacher. But there’s much more to Terry’s musical contributions than “Mumbles.” In addition to recording classics albums such as “In Orbit” and “Serenade to a Bus Seat” that showcased his impressive technique and emotive work on trumpet and especially flugelhorn, Terry has been a pioneer in music education for more than four decades. "Not only is Clark one of the world's greatest jazz icons, he's also just a great humanitarian -- and a great educator as well,” states Jim Widner, director of the University of Missouri St. Louis Jazz program. “Clark was a leader in jazz education. He was one of the first to go into high schools and colleges to perform with ensembles." Terry has also been continuing presence here in St. Louis, despite the fact he hasn’t lived here for many years. He has made many appearances at festivals and performances at Jazz at the Bistro, but many more at clinics and workshops teaching young students. Terry is now approaching his 93rd birthday on Dec. 13, and has endured severe health issues in recent years. He has now lost both legs to diabetes, and even before that, has had to play for the last few years seated or in a wheelchair. At his last appearance at the Greater St. Louis jazz festival in 2011, Terry was unable to play his horn, but his joy in performing shown through with a vocal rendition of “Mumbles” backed by the UMSL Jazz Ensemble. As Dean Minderman noted in a recent post on his informative blog, St. Louis Jazz Notes, a fund-raising campaign to help Terry pay for his costly health care expenses not covered by insurance (including $6,000 a month for 24-hour care) has been started by many of Terry’s friends and fellow musicians through the Jazz Foundation of America.